You are here: Home / How To Play Guitar / Jamorama Review, Are These Cheap Online Guitar Lessons Good Value? 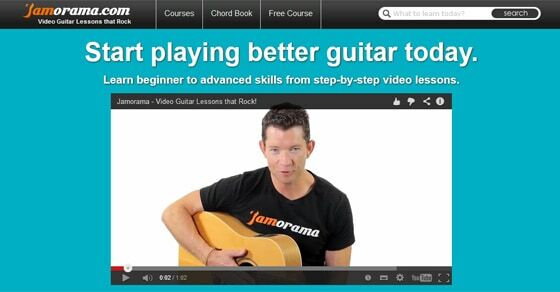 Jamorama Review, Are These Cheap Online Guitar Lessons Good Value? Hi guys. My name’s Shaun Letang from musicindustryhowto.com and today I’ll do a review for you of the Jamorama online guitar course. This is the course that’s run my Mike McKenzie, as you can see him here, and he’s a guitar instructor. In this course, him and his team actually give you hundreds of videos for those that are new to learning guitar; or maybe if you’re an intermediate but you want to learn some more. All right. When you actually log in to this course, this is the first page you’ll see. One of the things I personally notice is they got different levels so it doesn’t matter if you’re a beginner, intermediate, or an advanced guitarist, they’ve got some skills that they’re ready to teach you. Editor’s Note: You can see which the best online guitar course is over here. Is it Jamorama or another one? You can actually see all of the courses on the first page. There are actually seven courses, starting from beginners. And as you can see they cover other stuff over here. For example maintenance and care, and the skills and techniques. What I’m going to do is I’m actually going to look at one of these so you can actually see the kind of thing you get. In this one section, one of the seven, you actually get quite a few videos, it’s not just one video, one long video. It’s actually broken down. And on the left hand side here, you can actually see what subject you’re going to learn, on the right hand side you can see how long each video is. Just remember, this is an online course. So it doesn’t matter if you’re a bit slower at learning or if you want to go through them a lot faster. You can actually learn at your own speed as you have access to it for the whole month or more if you choose that option. What I’m actually going to do now is you can have a quick look at one of the videos. Shaun Letang: Okay, this is the introduction video. As you can see, Mike McKenzie teaches all the lessons; Like I mentioned, there’s over 100 videos, there’s hundreds of videos on there. So yeah. All right, let’s go back. Like I mentioned, there’s other sections. You can go into them as you wish. What I would advise you doing, obviously if you’re a beginner guitarists, you would actually go through this in a logical order. As well as giving all the videos they have here, you actually get a lot of bonus extras. Say, for example, you get some software, which teaches you to help identify different strings. You get a chord book, which I actually got a preview of over here. This is very handy, it shows you all the chords and how your fingers should be moving… and yeah, it’s pretty much it. The cost of this course, $10 a month. While there are a few online guitar courses out there, this one is probably the cheapest and for the price you get, you can’t really beat it. If you’re happy with just having one tutor in the form of Mike McKenzie (you can have a look at his website and see if you like him) then this is a really good option. Not only can you get the course for quite a good price, $10 a month, but if you know you’re dedicated and you want to keep up the training for the long term, you can actually buy 12 months for half price. So it’s only $6. If you aren’t too bothered about getting cheap onlne guitar lessons and budget isn’t an issue, you might also want to check out my Guitar Tricks vs JamPlay comparison. All three are good but cater for different needs, see see which would be best for you. My name is Shaun Letang from musicindustryhowto.com, and this has been my review of the Jamorama online guitar course.